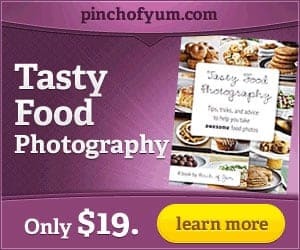 One of my favourite food blogs, Pinch of Yum, is having a holiday sale on their ebook, Tasty Food Photography! The sale is for 50% off with the coupon code: TFP50. It normally costs $19, but with this special coupon code you’ll only pay $9.50. I purchased the book a few months ago because I wanted to learn more about how to improve my food pictures. I found it very helpful and practical and I’m slowly plugging through it and putting what I learn into practice. It’s well worth it in my opinion! The sale runs from Thursday through till Monday at 11:59 pm. Remember use the code TFP50 to save 50% off! Visit Pinch of Yum to learn more and to purchase. I am a real fan of food photography.To me it is about the toughest image to produce well.I will be having a look at this.Thanks for the tip. This was sure an amazing deal ! from the photos on your site I’d say it’s paid off to have that book. 2 of my children are into photography too. My daughter takes courses but I think my son picks it up as he goes along. Amazingly, though one lives in Canada and one in England they both bought exactly the same camera within a week.